Maybe this post is only of local interest, but I wanted share some insight into a disturbing rumor that went viral at Davidson College after credible evidence emerged about neo-Nazi activity among a few Davidson students. The rumors were scary. The gist was that plans for a school shooting were discovered on a whiteboard in the college library. As Carol Quillen, Davidson’s president, noted in a faculty forum last week, the whiteboard incident was investigated at the time (which was several weeks ago) and thought to be related to a course project. Nevertheless, students and faculty alike have been understandably concerned about campus safety—especially in light of the reports of neo-Nazi students, including one who had apparently attended the white supremacist Charlottesville rallies last year. Yesterday some of my students connected the dots and realized that it was indeed a group project that caused the rumors. And not just any group project. It was their own group project. It took a while to reach this conclusion, because the rumors had so distorted reality that the students themselves didn’t recognize their own work as the basis for the rumors. Bear with me as I explain. The students are in DIG 101: Introduction to Digital Studies. In DIG 101 we spend several weeks learning about the spread and impact of internet conspiracy theories, including how online conspiracy theories can lead to ideological radicalization. As you can imagine, each new day provides fodder for class discussion. The whiteboard in question contained a flowchart for a group project about conspiracy theories, specifically the tragic Parkland school shooting, which some internet conspiracy theorists claim never happened. The flowchart connected a variety of conspiracy elements (biased media, false flags, crisis actors, etc.) that sprung up in the aftermath of the Parkland shooting. The flowchart contained no inflammatory statements or threats. It was diagnosing a problem. After brainstorming on the whiteboard and doing other work, the group presented their project to DIG 101 in the form of a case study on October 26. In class students considered school shooting conspiracy theories from various perspectives. These perspectives included a parent who had lost a child in the shooting and social media executives whose platforms have helped the spread of conspiracy theories. The students in this group designed the class study with incredible empathy toward with victims of school shootings and with enormous skepticism toward adherents of conspiracy theories. They are horrified that their own project about the dangers of internet conspiracies itself became the basis of a disturbing rumor. They never imagined their class project would contribute to a climate of fear on campus. As I said, this project took place several weeks ago, well before the Tree of Life synagogue shooting in Pittsburgh. It simply was not on the students’ minds last week, which is why they didn’t realize at first it was their group project at the heart of these rumors. Quite literally, one of the students in the group—in a class discussion about the whiteboard and the possibility that it was trolling or part of a class project—said with all earnestness to the rest of the class, “who would be stupid enough to draw up plans for a school shooting as part of a class project?” It bears repeating: the rumors had so distorted the contents of the whiteboard that even students in the group did not recognize their work as the basis for the rumors. It wasn’t until two days ago that one of my students made the connection, purely coincidentally. That student just happened to be in another class that just happened to have a faculty member sitting in for the day who just happened to have an accurate description of the whiteboard from the campus police report. The faculty member shared that description with the class. Once the student heard that the whiteboard contained two diagrams, with the words “a school shooting”, “4Chan,” “reporting it”, etc., and appeared to reference how information about school shootings traveled online, everything clicked in place for the student. The student then contacted the campus chief of police. As my fellow faculty members and college administrators have readily acknowledged, my students did absolutely nothing wrong (except perhaps forgetting to wipe their whiteboard, a lesson that will forever be burned into their souls). This was a legitimate course project, tackling a real world problem. Their case study and ensuing class discussion were excellent. The way their project about conspiracy theories yielded its own toxic stream of misinformation ironically highlights the need for critical media literacy. Davidson College still faces many difficulties in the days and weeks to come, but at least one terrible revelation from the past week we can now consider from a more contemplative perspective. I and my students are grateful for this community and its vision for a better world. In anticipation of the upcoming Modern Language Association annual convention, here’s a crowdsourced list of digital humanities sessions at the conference: MLA 2016 Digital Humanities Sessions. This community-authored work is licensed under a Creative Commons Attribution-ShareAlike License. Use, add, share. Digital Studies and Digital Art students at Davidson making cyborg interfaces with Makey Makeys and toys. 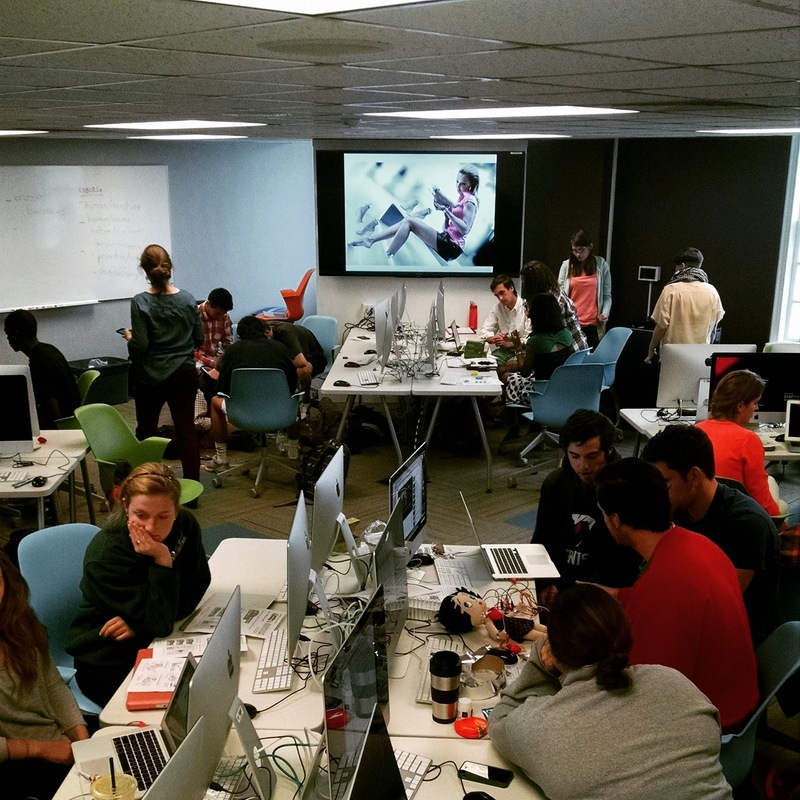 The Digital Studies program at Davidson College is growing! We now offer an interdisciplinary minor and, through our Center for Interdisciplinary Studies (CIS), an interdisciplinary major. Last year Digital Studies and the History Department partnered on a tenure-track search—leading to Dr. Jakub Kabala joining Davidson as a digital medievalist with a background in computational philology and digital spatial analysis. I’m delighted to announce that Digital Studies is collaborating once again on a tenure line search, this time with the Art Department. Along with Jakub and myself, this position will form the core of the Digital Studies faculty. My vision for Digital Studies has always emphasized three areas: (1) the history, practice, and critique of digital methodologies; (2) the study of cultural texts, media, and practices made possible by modern technology; and (3) the design and creation of digital art and new media, which includes robotics, interactive installations, and physical computing. Roughly speaking, I think of these three areas in terms of methodology, culture, and creativity. This latest tenure track search addresses the last area, though of course the areas blur into each other in very interesting ways. Here is the official search ad for the digital artist position. Please share widely! Davidson College invites applications for a tenure-track Assistant Professor of Art and Digital Studies, with a specialization in interactive installation, transmedia art, robotics, data art, physical computing, or a similar creative field. Artists must demonstrate a distinguished record of creative work and a commitment to undergraduate education. Preference will be given to artists with a broad understanding of contemporary trends in Digital and New Media Art, including its history, theory, and practice. MFA by August 1, 2016 is required. This tenure-track position is shared between the Art Department and Digital Studies Program. Art and Digital Studies at Davidson explore the contemporary technologies that shape daily life, focusing on critical making and digital culture. The successful applicant will teach in both Studio Art and Digital Studies. The candidate’s letter of application should highlight experiences that speak to both roles. The teaching load is 5 courses per year (reduced to 4 courses the first year). Classes include introductory and advanced digital art studio courses, as well as classes that focus on digital theory and practice. Apply online at http://jobs.davidson.edu/. A complete application includes a letter of application, CV, artist’s statement, teaching philosophy, and a list of three or more references. In addition, submit links for up to 20 still images or up to 7 minutes of video in lieu of a portfolio. The application deadline is December 1, 2015. Do not send letters of reference until requested. Davidson is strongly committed to achieving excellence and cultural diversity and welcomes applications from women, members of minority groups, and others who would bring additional dimensions to the college’s mission. Consistently ranked among the nation’s top liberal arts colleges, Davidson College is a highly selective, independent liberal arts college located in Davidson, North Carolina, close to the city of Charlotte. Davidson faculty enjoy a low student-faculty ratio, emphasis on and appreciation of excellence in teaching, and a collegial, respectful atmosphere that honors academic achievement and integrity. On Saturday, April 18, I gave the following talk at Bard College, as part of Bard’s Experimental Humanities Mellon lecture series. Sorry if it doesn’t read as an “academic” talk. It’s written to be told. Since 2009 I’ve been compiling an annual list of more or less digitally-oriented sessions at the Modern Language Association convention. This is the list for 2015. These sessions address digital culture, digital tools, and digital methodology, played out across the domains of research, teaching, and scholarly communication. For the purposes of my annual lists I clump these varied approaches and objects of study into a single contested term, the digital humanities (DH). If you’re an academic, you’ve probably heard about the recent New York Times article covering the decline of humanity majors at places like Stanford and Harvard. As many people have already pointed out, the article is a brilliant example of cherry-picking anecdotal evidence to support an existing narrative (i.e. the crisis in the humanities)—instead of using, you know, actual facts and statistics to understand what’s going on. Ben Schmidt, a specialist in intellectual history at Northeastern University, has put together an interactive graph of college majors over the past few decades, using the best available government data. Playing around with the data shows some surprises that counter the prevailing narrative about the humanities. For example, Computer Science majors have declined since 1986, while History has remained steady. Ben argues elsewhere that not only was the steepest decline in the humanities in the 1970s instead of the 2010s, but that the baseline year that most crisis narratives begin with (the peak year of 1967) was itself an aberration. Of course, Ben’s data is in the aggregate and doesn’t reflect trends at individual institutions. But you can break the data down into institution type, and find that traditional humanities fields at private SLACs like my own (Davidson College) are pretty much at late-1980s levels. Clearly we should be doing more to counter the perception that the humanities—and by extension, the liberal arts—are in crisis mode. My own experience in the classroom doesn’t support this notion, and neither does the data. I am thrilled to share the news that in August I will join the faculty of Davidson College, where I will be building a new interdisciplinary program in Digital Studies. This is a tremendous opportunity for me, and my immodest goal is to make Davidson College a model for other liberal arts colleges—and even research universities—when it comes to digital studies. This means I am leaving George Mason University, and I am doing so with much sadness. I have been surrounded by generous colleagues, dedicated teachers, and rigorous thinkers. I cannot imagine a better place to have begun my career. At the same time, my life at GMU has always been complicated by the challenges of a long distance commute, which I have written about here and elsewhere. My new position at Davidson will eliminate this commute. After seven or so years of flying 500 miles to work each week, it will be heaven to simply bike one mile to work every day. And a good thing too—because I have big plans for Digital Studies at Davidson and much work to do. Students are already enrolling in my Fall 2013 courses, but more than individual classes, we have an entire program to design. I am thrilled to begin working with my new colleagues in both the humanities and sciences. Together we are going to build something both unique and uniquely Davidson. When Does Service Become Scholarship? When does anything—service, teaching, editing, mentoring, coding—become scholarship? My answer is simply this: a creative or intellectual act becomes scholarship when it is public and circulates in a community of peers that evaluates and builds upon it. Now for some background behind the question and the rationale for my answer. What counts as the threshold of scholarship has been on my mind lately, spurred on by two recent events at my home institution, George Mason University. The first was a discussion in my own department (English) about the public humanities, a concept every bit as hard to pin down as its two highly contested constitutive terms. A key question in the department discussion was whether the enormous amount of outreach our faculty perform—through public readings, in area high schools, with local teachers and lifelong learners outside of Mason—counts as the public humanities. I suggested at the time that the public humanities revolves around scholarship. The question, then, is not when does outreach become the public humanities? The question is, when does outreach become an act of scholarship? The department discussion was a low-stakes affair. It decided the fate of exactly nothing, except perhaps the establishment of a subcommittee to further explore the intersection of faculty work and the public humanities. I absolutely appreciate Mason’s definition of scholarly achievement. But I like my definition of scholarship even more. Where does mine come from? From the scholarship of teaching—another field, like digital humanities, which has challenged the preeminence of the single-authored manuscript as the gold standard of scholarship (though, like DH, it doesn’t exclude such forms of scholarship). it becomes public; it becomes an object of critical review and evaluation by members of one’s community; and members of one’s community begin to use, build upon, and develop those acts of mind and creation. Let’s return to the CHSS committee’s evaluation of Sean’s work with Zotero. I don’t know enough about the way Sean framed his tenure case, but from the outside looking in, and knowing what I know about Zotero, it’s not only reasonable to acknowledge that Zotero meets these three criteria of scholarship (public, reviewed, and used), it’d take a willful misapprehension of Zotero, its impact, and implications to see it as anything but scholarship. Sean notes that the stance of narrow-minded RPT committees will have a chilling effect on digital work, and I don’t think he exaggerates. But I see this as a crisis that extends beyond the digital humanities, encompassing faculty who approach their scholarship in any number of “unconventional” ways. The scholarship of teaching, certainly, but also faculty involved in scholarly editing, the scholarship of creativity, and a whole host of public humanities efforts. The solution—or at least one prong of a solution—must be for faculty who have already survived the gauntlet of tenure to work ceaselessly to promote an atmosphere that pairs openness with critical review, yet which is not entrenched in any single medium—print, digital, performance, and so on. We can do this in the background by writing tenure letters, reviewing projects, and serving on committees ourselves. But we can and should also do this publicly, right here, right now. Like the pair of mice in Leo Lionni’s classic children’s book, I had a busy year in 2012. It was a great year, but an exhausting one. The year began last January with a surprise: I was mentioned by Stanley Fish in an anti-digital humanities screed in the New York Times. That’s something I can check off my bucket list. (By the way, my response to Fish fit inside a tweet.) Ironically, had Fish read my chapter in Debates in the Digital Humanities, which was published the very same week, he might have seen some strange correspondences between his stance toward the digital humanities and my own. This chapter, “Unseen and Unremarked On: Don DeLillo and the Failure of the Digital Humanities,” has recently become open-access, along with the rest of the book. Hats off to Matt Gold, the Debates editor, as well as his crew at the Graduate Center at CUNY and the University of Minnesota Press for making the book possible in the first place, and open and online in the second place. In January I also performed my first public reading of one of my creative works— Takei, George—during the off-site electronic literature reading at the 2012 MLA Convention in Seattle. There’s even grainy documentary footage of this reading, thanks to the efforts of the organizers Dene Grigar, Lori Emerson, and Kathi Inmans Berens. I also gave a well-received talk at the MLA about another work of electronic literature, Erik Loyer’s beautiful Strange Rain. And finally in January, I spent odd moments at the convention huddled in a coffee shop (this was Seattle, after all) working with my co-authors on the final revisions of a book manuscript. More about that book later in this post. All of this happened in the first weeks of January. And the rest of the year was equally as busy. In addition to my regular commuting life, I traveled a great deal to conferences and other gatherings. As I mentioned, I presented at the MLA, but I also talked at the Society for Cinema and Media Studies convention (Boston in March), Computers and Writing (Raleigh in May), the Electronic Literature Organization (Morgantown in June), and the Society for Literature, Science, and the Arts (Milwaukee in September). In May I was a co-organizer of THATCamp Piedmont, held on the campus of Davidson College. During the summer I was a guest at the annual Microsoft Research Faculty Summit (Redmond in July). In the fall I was an invited panelist for my own institution’s Forum on the Future of Higher Education (in October) and an invited speaker for the University of Kansas’s Digital Humanities seminar (in November). If the year began the publication of a modest—and frankly, immensely fun to write—chapter in an edited book, then I have to point out that it ended with the publication of a much larger (and challenging and unwieldy) project, a co-authored book from MIT Press: 10 PRINT CHR$(205.5+RND(1));: GOTO 10 (or 10 PRINT, as we call it). I’ve already written about the book, and I expect more posts will follow. I’ll simply say now that my co-authors and I are grateful for and astonished by its bestselling (as far as academic books go) status: within days of its release, the book was ranked #1,375 on Amazon, out of 8 million books. This figure is all the most astounding when you consider that we released a free PDF version of the book on the same day as its publication. More evidence that giving away things is the best way to also sell things. In addition to scholarly work, I’ve invested more time than ever this year in creative work. On the surface my creative work is a marginal activity—and often marginalized when it comes time to count in my annual faculty report. But I increasingly see my creativity and scholarship bound up in a virtuous circle. I’ve already mentioned my first fully-functional work of electronic literature, “Takei, George.” In June this piece appeared as a juried selection in Electrifying Literature: Affordances and Constraints, a media art exhibit held in conjunction with the 2012 Electronic Literature Organization conference. A tip to other scholars who aim to do more creative work: submit your work to juried exhibitions or other curated shows; if your work is selected, it’s the equivalent of peer-review and your creative work suddenly passes the threshold needed to appear on CVs and faculty activity reports. Another creative project of mine, Postcard for Artisanal Tweeting, appeared in Rough Cuts: Media and Design in Process, an online exhibit curated by Kari Kraus on The New Everyday, a Media Commons Project. My own blog is another site where I blend creativity and scholarship. My recent post on Intrusive Scaffolding is as much a creative nonfiction piece as it is scholarship (more so, in fact). And my favorite post of 2012 began as an inside joke about scholarly blogs. The background is this: during a department meeting discussion about how blogging should be recognized in our annual infrequent merit salary raises, a senior colleague expressed concern that one professor’s cupcake blog would count as much as another professor’s research-oriented blog. In response to this discussion, I wrote a blog post about cupcakes that blended critical theory and creativity. And cursing. The post struck a nerve, and it was my most widely read and retweeted blog post ever. About cupcakes. Late in 2012 my creative work took me into new territory: Twitterbots, those autonomous “agents” on Twitter that are occasionally useful and often annoying. My bot Citizen Canned is in the process of tweeting every unique word from the script of Citizen Kane, by order of frequency (as opposed to, say, by order of significance, which would have a certain two syllable word appear first). With roughly 4,400 unique words to tweet, at a rate of once per hour, I estimate that Citizen Kane will tweet the least frequently used word in the movie sometime five months from now.Another of the Twitterbots I built in 2012 is 10print_ebooks. This bot mashes up the complete text of my 10 PRINT book and generates occasionally nonsensical but often genius Markov chain tweets from it. The bot also incorporates text from other tweets that use the #10print hashtag, meaning it “learns” from the community. The Citizen Cane bot runs in PHP while the 10 PRINT bot is built in Processing. Mark Sample presents an unusual case. His work is at the edge of his discipline’s interaction with digital media technology. It blurs the lines between scholarship, teaching, and service in challenging ways. It also marks the point where traditional scholarly peer review meets the public interface of the internet. This makes for some difficulty in assessing his case. In February my dean voted in favor of my case too. Next came the provost’s support at the end of March. In a surprise move, the provost recommended me for tenure on two counts: genuine excellence in teaching and genuine excellence in research. Professors usually earn tenure on the strength of their research alone. It’s uncommon to earn tenure at Mason on excellence in teaching, and an anomaly to earn tenure for both. By this point, approval from the president and the Board of Visitors (our equivalent of a Board of Trustees) might have seemed like rubber stamps, but I wasn’t celebrating tenure as a done deal. In fact, when I finally received the official notice—and contract—in June, I still didn’t feel like celebrating. And by the time my tenure and promotion went into effect in August 2012, I was too busy gearing up for the semester (and indexing 10 PRINT) to think much about it. In other words, I reached the end of 2012 without celebrating some of its best moments. On the other hand, I feel that most of its “best moments” were actually single instances in ongoing processes, and those processes are never truly over. 10 PRINT may be out, but I’m already looking forward to future collaborations with some of my co-authors. I wrote a great deal in 2012, but much of that occurred serially in places like ProfHacker, Play the Past, and Media Commons, where I will continue to write in 2013 and beyond. What else with 2013 bring? I am working on two new creative projects and I have begun sketching out a new book project as well. Next fall I will begin a year-long study leave (Fall 2013/Spring 2014), and I aim to make significant progress on my book during that time. Who knows what else 2013 will bring. Maybe sleep? As an example of the deformed humanities I offered up my work Hacking the Accident. But what would the deformed humanities look like in other fields? It’s one thing to imagine a scholar who already studies fiction creatively destroying existing texts. But it’s quite another to imagine a scholar who owes a certain debt to facts working in the deformed humanities. A course taught by my George Mason colleague Mills Kelly provides an illustrative case of the deformed humanities in the field of history. Mills’ class “Lying about the Past” explores the social role of hoaxes throughout history—the Piltdown man, Hitler’s diary, and so on. For the class’s final project, students design their own hoaxes and then unleash them upon an unsuspecting public. In 2008 students created a hoax about Edward Owens, the so-called last American pirate. Students created a Wikipedia page with false sources, a blog detailing a fictional student’s discovery of the last American pirate—which the class backdated to make it look like the blog had been written over a four-month period, and other faked primary and secondary sources. When Mills revealed the hoax at the end of the semester (and students copped to it on Wikipedia), his IP address was banned from Wikipedia and the page was marked for deletion. Q: What happens when you teach students how to lie? A: They learn how to be historians. Call him a cynic, but Mills is dead on. History is comprised of lies. And if not outright falsehoods, then half-truths, exaggerations, and omissions. When I first began to think of creative and critical work in terms of the deformed humanities I hadn’t focused on the political dimensions of the concept—aside from self-consciously reclaiming a potentially troubled term, deformity. But I’ve quickly come to believe that the deformed humanities is a political humanities, a politicized humanities. As a number of scholars and public intellectuals have noted, the humanities are under attack. One particularly cogent response to the attacks comes from then-American Historical Association president Anthony Grafton. Writing in the January 2011 issue of Perspectives on History, Grafton argued that perhaps the most vital argument one can make in favor of the humanities is “the argument that scholarship matters.” Historians and other humanists model “honest, first-hand inquiry” and an “austere, principled quest for knowledge.” Such clear-headed and rational scholarship, Grafton believes, is especially needed to combat the misrepresentations of the past and present that pervade our mediated world. Mills’ example—and the deformed humanities—suggests that while Grafton goal’s is noble, it is the wrong approach. Or at least not the only approach. Why fight lies with the truth when you can fight them with other lies? Lies that reveal the truth. Scholarship ought to be rooted in knowledge, not necessarily facts. Looking beyond a few undergraduate hoaxes, such a strategy—outlying the liars—is a particularly potent response to attacks on the humanities. It’s one, however, that Progressives are likely to avoid. One of the unfortunate lasting legacies of the Bush era is that Progressives automatically discount anyone who strays too far from objective perspectives or evidentiary reasoning. In the face of Bush’s dismissal of the “reality-based community,” Progressives have enshrouded themselves in facts and statistics and studies. This is what Grafton argues for as well. And it’s exactly the wrong way to fight narrow-minded, unjust, subjective and self-serving beliefs. Fight truthiness with truthiness, something Jon Stewart and Stephen Colbert long ago figured out, but which the humanities have forgotten. Truth is not relative, but it is overrated. A Digital Hornbook for the Digital Humanities? The hornbook was not a book, but a small wooden board with a handle. 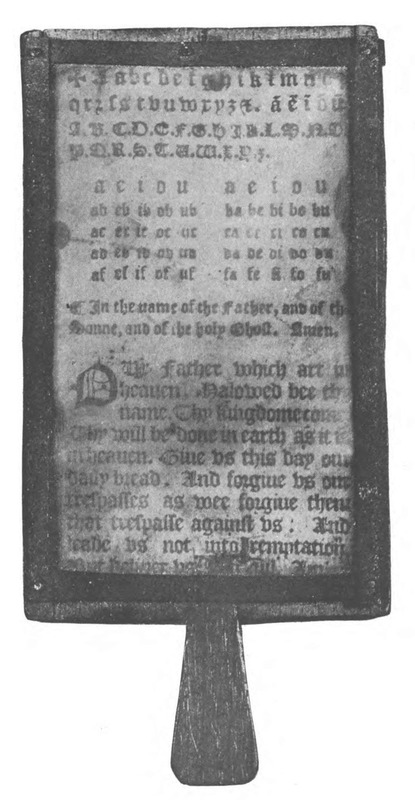 A sheet of vellum inscribed with a lesson—typically the alphabet and the Lord’s Prayer—was attached to one side and covered by a thin, transparent layer of horn or mica. Historians don’t know much about hornbooks, other than they were important tools for primary education in the 16th and 17th centuries in England, Germany, Holland, and by way of the Puritans, the American colonies. A boy stands outside the Tower of Knowledge (each level representing progressively heightened domains of learning, from the grammar of Donatus and Priscian on the lower levels, to the science and philosophy of Cicero, Aristotle, Seneca and Pliny on the upper levels). To enter the Tower of Knowledge the boy need only accept the hornbook from his teacher and master it. As Plimpton puts it, the hornbook was “the key to unlock the treasures of learning” (4). But the hornbook wasn’t simply a metaphorical key. It answered a very real concern of material culture at the time. Parchment, and later, paper, was simply too costly to be put in the hands of young learners. With its vellum primer protected like a laminated lesson, the sturdy hornbook was a hardware solution to a social problem. On some hornbooks the vellum could slide out from underneath the translucent horn and be replaced by other lessons. The hornbook in this way was a kind of 17th century iPad. Much more durable than paper, hornbooks were apparently passed down between students, sibling to sibling, generation to generation. What’s surprising about hornbooks, given their durability and symbolic as well as literal value in early modern education, is how few have survived into the 20th and 21st centuries. Plimpton lamented in 1916 that “the British Museum has only three, and the Bodleian Library at Oxford one” (5). In fact, the most exhaustive collection of hornbooks is probably Plimpton’s own collection, amassed over years and now housed at Columbia University. What applications and documents might be included on a “Digital Humanities Creator Stick,” a collection of tools that could fit on a USB flash drive, allowing students, teachers, researchers, and anyone else to work on digital humanities projects. An individual would plug the stick into any computer and instantly have access to what she needs to get work done. Unplug the stick and she takes those tools with her. In my mind I’ve been comparing George’s digital humanities creator stick (or DH jump drive, as Roger Whitson described it) to a hornbook. Like the hornbook in Reisch’s Tower of Knowledge, it provides entry into a world that might otherwise be closed to the newcomer. Even the paddle shape of the hornbook resembles a USB flash drive. Likening a digital humanities jump drive to an 17th century hornbook requires a certain amount of historical and technological blindness, but I’d like to entertain the comparison briefly, in order to find out if the fate of the hornbook gives us any insight into a similar kind of tool for the digital humanities. The hornbook arose during a particular historical moment to address a particular social problem. I called it a piece of hardware earlier, but really, it was a platform, in much the same way the Nintendo Wii is a platform. The wooden board itself and the translucent horn overlay were the hardware, while the vellum or paper lesson was the software. As platform studies has shown, however, hardware and software alone do not comprise the sum total of any technological platform. Use and social context are as much a part of the platform as the physical object itself. And yet we don’t actually know what students did with their hornbooks or how they used them. We have glimpses—a few illustrations, some mentions in literature, a handful of advertisements. But the full scope of how teachers and students had meaningful (or not so meaningful) interactions with the tool and in what environments is lost to us. We simply don’t know. This missing social element of the hornbook makes me think of the DH creator stick. The THATCamp Piedmont session prompted a lively discussion. But I know George was initially frustrated with the direction of this conversation, which trended toward the abstract, ranging from questions about the digital divide to issues surrounding digital fluency. George had wanted—and the collaborative notes generated during the session reflect this—to focus more concretely on assembling a definite list of tools and documentation that could be put on a USB flash drive. At one point in the session (probably after I had introduced a Lego versus Ikea approach to getting stated in the digital humanities), George compared assembling a digital humanities toolkit to a homeowner putting together his or her first toolbox. You know you need a hammer, a screwdriver, and a few other common tools. Before you head to the hardware store you don’t need to philosophize about the nature of home itself. A homeowner doesn’t ask, What is a home? A homeowner goes out and buys a hammer. I appreciated the analogy and George’s efforts to ground the discussion. I’m not so sure, though, that we in the digital humanities have figured out what our “home” is, much less what our essential tools are. I am not ready to foreclose the discussion about what we ought to be doing with our tools, which surely would influence what those tools are. I am not ready, to use the hornbook as a metaphor, to affix a standard lesson underneath a protective laminate of horn. And to be sure, I know very few digital humanists who would argue differently. I doubt that anyone who was in the THATCamp session would want to declare this or that set of tools to be the canonical tools of DH, or this or that set of practices to be the only valid approach to digital humanities work. This openness is one way a digital hornbook differs from the historical hornbook, which was clearly meant to be the first step in a rigidly prescribed way of thinking. I can think of some humanists a hornbook might appeal to in this regard, but no digital humanists. A digital hornbook would avoid the monologic authority of a historical hornbook by not only including a variety of tools but also including a range of documentation and pedagogical material. 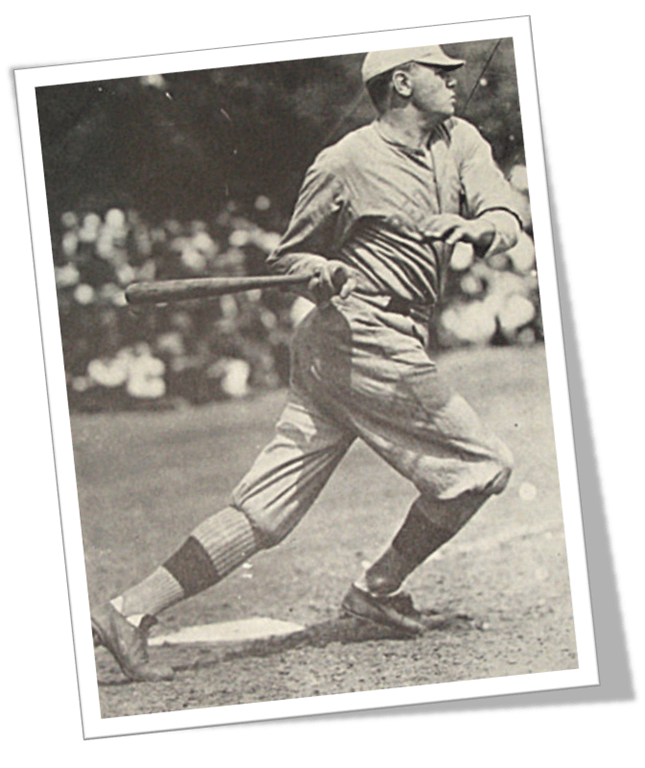 George mentioned several times in the session that while we had compiled a great list of tools, we hadn’t thought about the kind of guides or tutorials that should be included on the DH stick. He’s right. It wasn’t until toward the end of the session that we added some guides—mostly standard, official documentation of the various tools and services on the list. And then, at last, a few more substantive, scholarly perspectives on the digital humanities found their way onto the ideal DH Creator Stick: A Companion to Digital Humanities, Hacking the Academy, and Debates in the Digital Humanities. It’s the presence of these last two texts in particular that finally make the DH Creator Stick more than an inert catalog of portable apps. Hacking the Academy and Debates in the Digital Humanities fill a role that none of the other tools or guides on the proposed list do. They fill an absence that mirrors the unknown social life of the hornbook, for they tell us about the social life of the digital humanities. They model the digital humanities in action. And they do so by presenting a multiplicity of voices, a range of concerns, and most important to broadening the digital humanities audience, an ongoing and reiterative invitation to students, teachers, and young scholars to consider the impact of the digital on the questions that humanists ask of the world. It’s crucial to have documents like these available for students and novice practitioners, but I would go farther. What we most need to include on a digital hornbook for newcomers to the digital humanities is precisely that which can never be distilled digitally. It’s an attitude, an ethos. Perhaps the closest we might come is dumping the entire contents of Day of DH onto the flash drive, all four years of blog posts about what people actually do during their daily work. This material might give aspiring digital humanists (not to mention humanists) a better entry point into the discipline than any set of tools or tutorials. Even then, though, the diverse principles that inspire us may not shine through. I’ve labeled my own approach deformative humanities, but there are many other ways to conceive of the spirit that motivates digital humanists. In any case, the real challenge we face is capturing and relaying this attitude. A 4GB (or 8GB or 16GB or 32GB) flash drive can hold a fantastic number of applications and documents, but it’s a capacity that may mislead us into thinking that the DH jump stick would be a powerful tool in and of itself. The prescribed lesson on a hornbook teaches us very little, apart from telling us what society deemed necessary to enter the Tower of Knowledge. The contents of a flash drive similarly teach us very little, apart from demonstrating what a group of people—we digital humanists—valued at a certain moment in the early 21st century. Centuries from now I would not want a media archaeologist bemoaning the utter lack of context surrounding a flash drive housed in Special Collections that was obliquely labeled “DH Creator Stick.” The digital humanities is people and practices, not tools and documentation. The real question is, can our tools and documentation convey this? Plimpton, George Arthur. The Hornbook and Its Use in America. Worcester, MA: American Antiquarian Society, 1916. 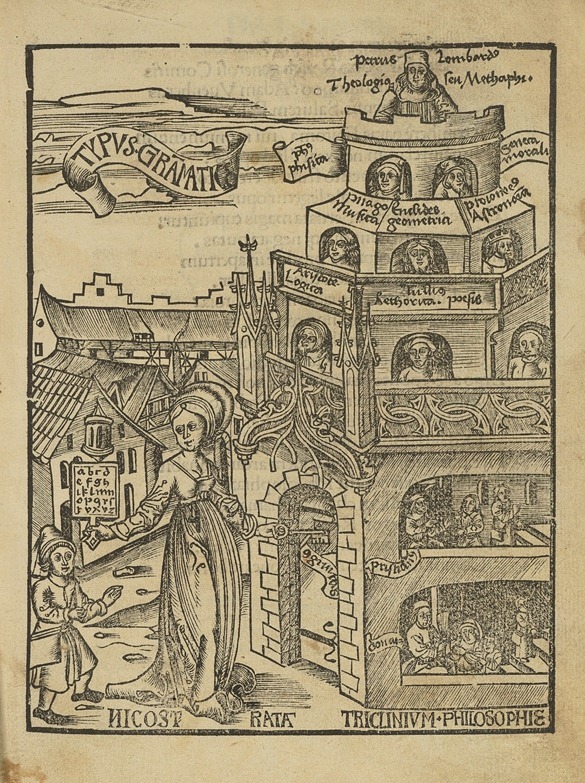 Reisch, Gregor, d. 1525, “Margarita Philosophica,” in CU Libraries Exhibitions , Item #14 (accessed May 11, 2012). I’ve gone on record as saying that the digital humanities is not about building. It’s about sharing. I stand by that declaration. But I’ve also been thinking about a complementary mode of learning and research that is precisely the opposite of building things. It is destroying things. I want to propose a theory and practice of a Deformed Humanities. A humanities born of broken, twisted things. And what is broken and twisted is also beautiful, and a bearer of knowledge. The Deformed Humanities is an origami crane—a piece of paper contorted into an object of startling insight and beauty. I come to the Deformed Humanities (DH) by way of a most traditional route—textual scholarship. In 1999 Lisa Samuels and Jerry McGann published an essay about the power of what they call “deformance.” This is a portmanteau that combines the words performance and deform into an interpretative concept premised upon deliberately misreading a text, for example, reading a poem backwards line-by-line. As Samuels and McGann put it, reading backwards “short circuits” our usual way of reading a text and “reinstalls the text—any text, prose or verse—as a performative event, a made thing” (Samuels & McGann 30). Reading backwards revitalizes a text, revealing its constructedness, its seams, edges, and working parts. In many ways this idea of textual transformation as an interpretative maneuver is nothing new. Years before Samuels and McGann suggested reading backward as the paradigmatic deformance, the influential composition professor Peter Elbow suggested reading a poem backwards as a way to “breathe life into a text” (Elbow 201). Still, Samuels and McGann point out that “deformative scholarship is all but forbidden, the thought of it either irresponsible or damaging to critical seriousness” (Samuels & McGann 34–35). Yet deformance has become a key methodology of the branch of digital humanities that focuses on text analysis and data-mining. This is an argument that Steve Ramsay makes in Reading Machines. Computers let us practice deformance quite easily, taking apart a text—say, by focusing on only the nouns in an epic poem or calculating the frequency of collocations between character names in a novels. But however much deformance sounds like a progressive interpretative strategy, it actually reinscribes more conventional acts of interpretation. Samuels and McGann suggest—and many digital humanists would agree—that “we are brought to a critical position in which we can imagine things about the text that we did not and perhaps could not otherwise know” (36). And this is precisely what is wrong with the idea of deformance: it always circles back to the text. Even the word itself—deformance—seems to be a hedge. The word is much more indebted to the socially acceptable activity of performance than the stigmatized word deformity. It reminds me of a scene in Alison Bechdel’s graphic memoir Fun Home, where the adult narrator Alison comments upon her teenage self’s use of the word “horrid” in her diary. “How,” Bechdel muses, “horrid has a slightly facetious tone that strikes me as Wildean. It appears to embrace the actual horror…then at the last second nimbly sidesteps it” (Bechdel 174). In a similar fashion, deformance appears to embrace the actual deformity of a text and then at the last possible moment sidesteps it. The end result of deformance as most critics would have it is a sense of renewal, a sense of de-forming only to re-form. 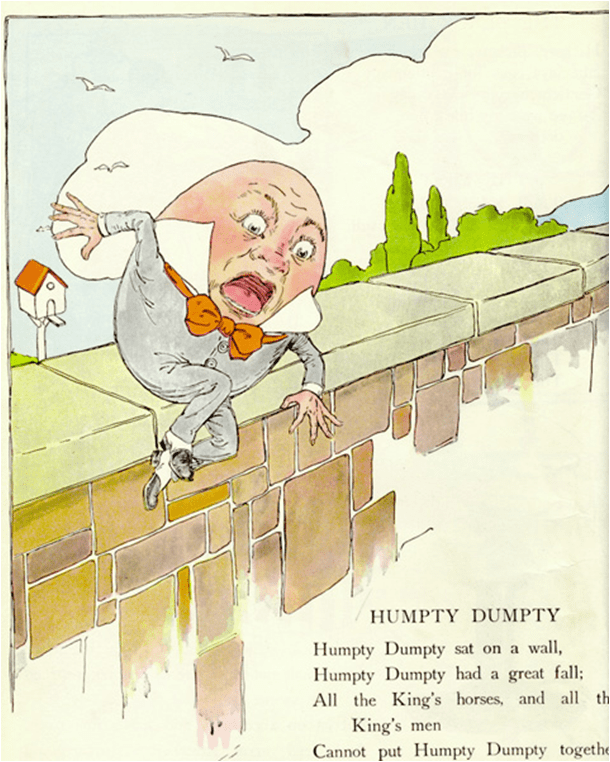 To evoke a key figure motivating the playfulness Samuels and McGann want to bring to language, deformance takes Humpty Dumpty apart only to put Humpty Dumpty back together again. And this is where I differ. I don’t want to put Humpy Dumpty back together. Let him lie there, a cracked shell oozing yolk. He is broken. And he is beautiful. The smell, the colors, the flow, the texture, the mess. All of it, it is unavailable until we break things. And let’s not soften our critical blow by calling it deformance. Name it what it is, a deformation. In my vision of the Deformed Humanities, there is little need to go back to the original. We work—in the Stallybrass sense of the word—not to go back to the original text with a revitalized perspective, but to make an entirely new text or artifact. The deformed work is the end, not the means to the end. The Deformed Humanities is all around us. I’m only giving it a name. Mashups, remixes, fan fiction, they are all made by breaking things, with little regard for preserving the original whole. With its emphasis on exploring the insides of things, the Deformed Humanities shares affinities with Ian Bogost’s notion of carpentry, the practice of making philosophical and scholarly inquiries by constructing artifacts rather than writing words. In Alien Phenomenology, Or, What It’s Like to Be a Thing, Bogost describes carpentry as “making things that explain how things make their world” (93). Bogost goes on to highlight several computer programs he’s built in order to think like things—such as I am TIA, which renders the Atari VCS’s “view” of its own screen, an utterly alien landscape compared to what players of the Atari see on the screen. Where carpentry and the Deformed Humanities diverge is in the materials being used. Carpentry aspires to build from scratch, whereas the Deformed Humanities tears apart existing structures and uses the scraps. For a long while I’ve told colleagues who puzzle over my own seemingly disparate objects of scholarly inquiry that “I study systems that break other systems.” Systems that break other systems is the thread that connects my work with electronic literature, graphic novels, videogames, code studies, and so on. Yet I had never thought about my own work as deformative until earlier this year. And it took someone else to point it out. This was my colleague Tom Scheinfeldt, the managing director of the Roy Rosenzweig Center for History and New Media. In February, Scheinfeldt gave a talk at Brown University in which he argued that the game-changing element of the digital humanities was its performative aspect. As an example, Scheinfeldt mentions a project of mine, which I had never thought about in terms of deformance. This was a digital project and e-book I made last fall called Hacking the Accident. Hacking the Accident is a deformed version of Hacking the Academy, an edited collection forthcoming by the digitalculturebooks imprint of the University of Michigan Press. Hacking the Academy is a scholarly book about the disruptive potential of the digital humanities, crowdsourced in one week and edited by Dan Cohen and Tom Scheinfeldt. Taking advantage of the generous BY-NC Creative Commons license of the book, I took the entire contents of Hacking the Academy, some thirty something essays by leading thinkers in the digital humanities, and subjected them to the N+7 algorithm used by the Oulipo writers. This algorithm replaces every noun—every person, place, or thing—in Hacking the Academy with the person, place, or thing—mostly things—that comes seven nouns later in the dictionary. The results of N+7 would seem absolutely nonsensical, if not for the disruptive juxtapositions, startling evocations, and unexpected revelations that ruthless application of the algorithm draws out from the original work. Consider the opening substitution of Hacking the Academy, sustained throughout the entire book: every instance of the word academy is literally an accident. Other strange transpositions occur. Every fact is a fad and print is a prison. Instructors are insurgents and introductions are invasions. Questions become quicksand. Universities, uprisings. Scholarly associations wither away to scholarly asthmatics. Disciplines are fractured into discontinuities. Writing, the thing that absorbs our lives in the humanities, writing, the thing that we produce and consume endlessly and desperately, writing, the thing upon which our lives of letters is founded—writing, it is mere “yacking” in Hacking the Accident. These are merely the single word exchanges, but there are longer phrases that are just as striking. Print-based journals turn out as prison-based joyrides, for example. I love that The Chronicle of Higher Education always appears as The Church of Higher Efficiency; it’s as if the newspaper was calling out academia for what it has become—an all-consuming, totalizing quest for efficiency and productivity, instead of a space of learning and creativity. Can an allegiance edit a joyride? Can a lick exist without bookmarks? Can stunts build and manage their own lecture mandrake playgrounds? Can a configuration be held without a prohibition? Can Twitter replace a scholarly sofa? At the most obvious level, the work is a parody of academic discourse, amplifying the already jargon-heavy language of academia with even more incomprehensible language. But one level down there is a kind of Bakhtinian double-voiced discourse at work, in which the original intent is still there, but infused with meanings hostile to that intent—the print/prison transposition is a good example of this. I’m convinced that Hacking the Accident is not merely a novelty. It’d be all too easy to dismiss the work as a gag, good for a few amusing quotes and nothing more. But that would overlook the several levels in which Hacking the Accident acts as a kind of intervention into academia. A deformation of the humanities. A deformation that doesn’t strive to put the humanities back together and reestablish the integrity of a text, but rather, a deformation that is a departure, leading us somewhere new entirely. The Deformed Humanities—though most may not call it that—will prove to be the most vibrant and generative of all the many strands of the humanities. It is a legitimate mode of scholarship, a legitimate mode of doing and knowing. Precisely because it relies on undoing and unknowing. Ayaroglu, Emre. Grulla. 2008. 19 Feb. 2012. <http://www.flickr.com/photos/emraya/3043088482/>. Bechdel, Alison. Fun Home: A Family Tragicomic. Boston: Houghton Mifflin, 2007. Print. Bogost, Ian. Alien Phenomenology, or, What It’s Like to Be a Thing. Minneapolis: University of Minnesota Press, 2012. Print. Elbow, Peter. “Breathing Life into the Text.” When Writing Teachers Teach Literature: Bringing Writing to Reading. Portsmouth, NH: Heinemann, 1995. 193–205. Print. Ramsay, Stephen. Reading Machines: Toward and Algorithmic Criticism. University of Illinois Press, 2011. Print. Samuels, Lisa, and Jerome McGann. “Deformance and Interpretation.” New Literary History 30.1 (1999) : 25–56. Print. Scheinfeldt, Tom. “Game Change: Digital Technology and Performative Humanities.” Found History 15 Feb. 2012. 19 Feb. 2012. <http://www.foundhistory.org/2012/02/15/game-change-digital-technology-and-performative-humanities/>. Stallybrass, Peter. “Against Thinking.” PMLA 122.5 (2007) : 1580–1587. Print.